In this episode Shahriar demos the world’s fastest oscilloscope! The Agilent DSA-X 96204Q offers 160GS/s of conversion rate with a bandwidth of 62GHz on two dedicated ‘RealEdge’ channels. It can also provide 80GS/s conversion rate and 33GHz of bandwidth on four simultaneous channels. The unit demoed in this video is equipped with all available options and is valued at over 0.5 million US dollars. The block diagram of various sub-systems of the oscilloscope are presented and the principle operation of the instrument is explained. A 56Gb/s PRBS-15 signal is applied to the scope from a Centellax 2G2P5A (now Agilent N4975A) and the resulting data pattern is examined in real-time. 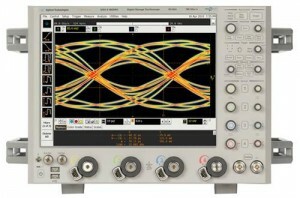 Various scope functions are also presented as well as the capability to observer bit failures at baud-rate using this instrument. As a second experiment, two 3.125Gb/s PRBS-7 data streams are simultaneously up-convered to 20GHz and 40GHz respectively by using a pair of MITEQ mm-wave DSB tripple balanced mixers and a pair of Avantek 20-40GHz YIG oscillators. The resulting two signals are combined by using a power-combiner and fed to the oscilloscope. The capability of the instrument to act as an ultra-broadband software-defined radio is demonstrated by recovering the two PRBS sequences simultaneously through DSP post processing. The block diagram of this setup can be downloaded from here. I’d like to thank Mr. Neil Hoffman from Agilent for enabling this demo and Dr. Jeffery Lee for his help with the experiments. hello i just found this video and am just amazed iam a hobbyist and love this kind of stuff i wish i understood more but you do a great job explainging the information and operation. You and Dave Jones over at the EEVblog are just great. I have one question if you dont mind what would someone need a scope like this for? I just wanted to let you know that I thoroughly enjoy the signal path. Even thou I do not get it all I hope that you continue to make these videos. happy new year. Thank you very much and have a pleasant day. thanks for this demo. I very much liked the SDR part of it. Have you considered releasing the captured data and the MATLAB code? Very good. please keep it up. summing up product review, product working, as well as an appropriate experiment. thanx for sharing knowledge. you are awesome shahriyar……………..
Great job! One thing; for non-periodic signals it’s best to measure the noise using the full screen (rather than over a cycle) and use “AC” to reject any DC because we’re interested in the noise. Would it be possible to download any of your videos in the near future as I don’t have fast internet connection at the moment and would like to download them for viewing offline. EEVblog videos are downloadable via a link beneath the videos. Something similar on your site would be fantastic. If u use Firefox u can download the videos with the plugin DownloadHelper. MATLAB can transfer data back and forth from instruments directly using Instrument Control Toolbox. Thank you Shahriar, probably as close as I’ll ever get to one of these! Very impressive. The “gaussian” at the end of the spectrum, (60GHz?? ), is the first order Intermodulation? (20+40 = 60GHz). On the left (DC?? ), could it be the second order intermodulation? The (|20-40| = 20, which then intermodulates again |20-20| = 0GHz?? Absolutely awesome video!!!! Keep the good work! The One at DC, could also be because the first harmonic of the 20GHz is at 40GHz, which intermodulates with the carrier at 40GHz, thus 0GHZ? Hi, could it be that decode of upper frequence was bad because you put upper lo too close to second harmonic of lower lo. It seemed that signals were overlapping? Please can you post the Matlab code so I can see how you did the demod? Is that Newcastle Brown Ale? The last two usually just mentioned and never really dealt with in articles on the web.